One of the coolest features of the Mac OS has long been its exceptional support for multiple monitors as an “extended desktop” (a.k.a., “screen spanning” mode). In extended desktop mode, two or more displays can act as a single Desktop — move your mouse cursor off the edge of one and it will appear at the corresponding edge of another. Way back when Windows was first getting… well, windows , Mac users were using extended desktop mode to view multiple documents; documents and application palettes; and even multiple applications side by side. Unfortunately, not all Mac users can take advantage of extended desktop mode. In order to differentiate their “professional” computer lines from the “consumer” ones, Apple’s consumer-level Macs (the iMac, eMac, and iBook) don’t support this feature. Although all recent consumer models provide at least a mini-VGA video port, any display connected to that port can only mirror — show the same thing as — the computer’s main display. So, then, how do you explain the photo below? No, you’re not imagining things. That really is a flat-panel display connected to an iMac G5 in extended desktop mode. But how did we do it? Although many people assume that Apple’s consumer-level computers don’t support screen spanning because they use lower-end video cards or because of some other type of hardware limitation, that’s not really it — the video cards found in all of Apple’s latest consumer models fully support this feature. The real reason is that Apple has disabled extended desktop mode in Open Firmware. If you don’t know what Open Firmware is, don’t worry; the key here is that if this feature can be disabled in Open Firmware, it can also be enabled in the same way. The trick is how to do it. You could manually type the appropriate commands in Open Firmware at startup, but the sight of Open Firmware — which looks a lot like Terminal — is scary for many users. Even worse, a typo could leave your Mac unable to even boot. Warning: Make sure you read the list of supported computers and video cards. More importantly, pay attention to those video cards — such as the ATI Rage series — that are specifically not supported. Even if your Mac is supported, keep in mind that this exercise is not supported by Apple. Though theoretically harmless (and reversible), it’s not guaranteed. And it likely voids your Mac’s warranty. If you ever want to revert to Apple’s original Open Firmware settings, you either run Screen Spanning Doctor again and click the Disable Spanning button or you reset your Mac’s NVRAM. As a side note, if you read the list of supported Macs on the Screen Spanning Doctor website, you’ll notice that our new iMac G5 isn’t listed. However, since it uses the same video card (NVIDIA GeForce FX 5200 Ultra) as the previous 17-inch and 20-inch iMacs, which are supported, we decided to risk it for the benefit of you, our readers. We can report that in our testing, on our iMac, it works great. 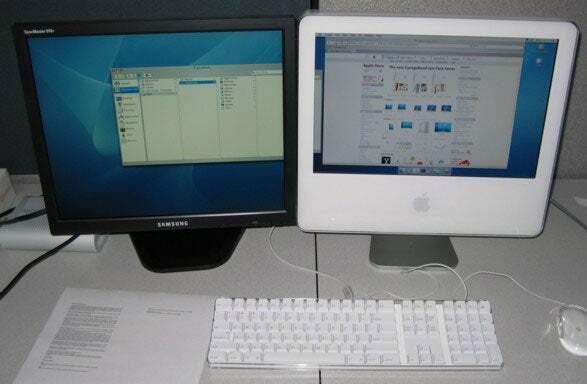 Super-observant readers will notice one other odd thing in the iMac G5 photo above: The iMac is driving a DVI display. Why is this odd? The monitor ports on the newer iBooks, iMacs, and eMacs are mini-VGA, which means they only support VGA displays. That leaves out flat-panel LCD displays that don’t have a VGA port (including all of Apple’s LCD displays), and it excludes any of Apple’s displays that use the proprietary ADC connector.